There's no question why this video is trending in Canada. 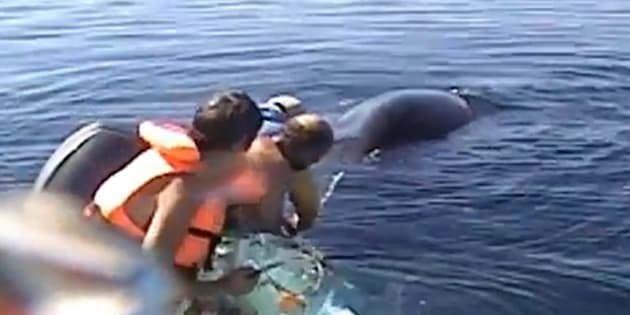 Shot Feb. 14, 2011, in the Sea of Cortez between California's Peninsula and Mexico, the video shows the rescue of a young humpback whale entangled in fishing nets. The animal reacts with what appears to be an amazing expression of joy, if not gratitude, to its rescuers — at least 40 spectacular breaches of the surface. Michael Fishbach, co-founder of The Great Whale Conservancy (GWC), narrates his encounter with the animal. At first, the animal appeared to be dead, yet Fishbach investigated and quickly discovered that the poor creature was tangled in a fishing net. The humans had to act fast; what began as a tragedy soon became a thrilling rescue as Fishbach and his crew labored to free the young whale. The entire encounter was caught on videotape and later narrated by Fishbach himself. This young whale knows how to show appreciation by treating them to a magnificent aerial spectacle after it was finally freed.